The countdown is on! We leave for Ghana on January 13, 2012.. yes, that IS Friday the 13th, so… that’s just… great. First of all a HUGE thank you to those of you who have donated to The Signing Time Foundation (501c3)! I know you didn’t know it, but if you donated $50 or more, you will be getting a handwritten “Thank You” “receipt” from me, with a photo of us in Ghana. (Obviously that will be coming to you after the trip) and that offer still stands, just click the donate button… Warning: It feels good! Secondly… we have yet another way for you to contribute!!! 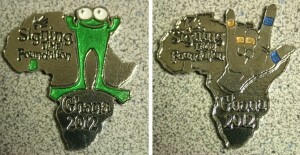 Check out our limited edition, Signing Time Foundation Ghana 2012 pewter pins! We are making a limited number of these (because that’s what “limited edition” means) so when they are gone… they are GONE! The best part is that this is a very affordable way to make a difference, each pin is $10 and that includes shipping to your U.S. address – and that means that just about $5 of each purchase goes straight to the Ghana 2012 trip. YeeHaw!